In my first post on this blog, I showed you how to get a simple Publish/Subscribe example working very quickly using MassTransit and RabbitMQ. I’d always planned to show you how to move that example to the cloud, with Microsoft Azure being a compelling competitor in this space, especially for the .NET developer (though not exclusively for .NET). Let’s take a look at some of the cool things we can take advantage of in the cloud, including auto-scaling our subscribers to match the load of messages being published. As discussed in my first post, the first thing you need is a message queuing framework. MassTransit supports MSMQ, RabbitMQ, and others. I really like RabbitMQ for this role for a variety of reasons, but since we’ve already looked at RabbitMQ in a number of previous posts, I thought it would make sense to take a look at Azure Service Bus. Since we’re going to be deploying to Azure, it makes a lot of sense to consider this as an option. 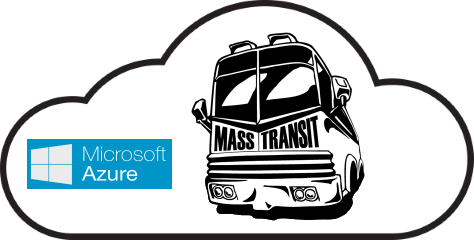 Thankfully, there is a MassTransit transport for Azure Service Bus (find the source on GitHub here). While we could have setup a RabbitMQ server or two using Azure Virtual Machines (either Windows or Linux), it is easier to get going on Azure by using the Azure Service Bus. Also, as we’ll find out later, when you use the Azure Service Bus, you can tie your cloud service scaling to the size of your message queue. 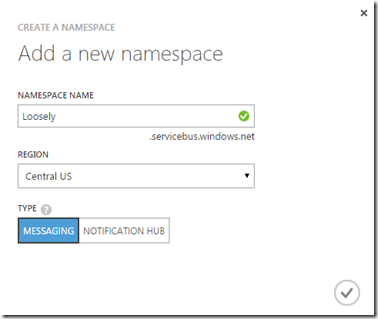 When you click the OK button, Azure will create and activate your new Azure Service Bus namespace. There’s nothing else to setup at this time as MassTransit will automatically create the queues and topics that it will require for your publish/subscribe code. In order to be able to create cloud services easily in Visual Studio, you should install the Azure SDK. This can be downloaded from the Azure Downloads page. Download the VS 2013 or 2012 install under the .NET heading, depending on your version of Visual Studio. When you’re writing a new project from scratch, you go through many permutations and refactor as you go. Initially, this example had the service bus setup code duplicated in both the publisher and subscriber projects. This is fine, particularly if you really aren’t in a position to share much code between the two sides (except the contracts of course). However, in my case, I preferred to use a common class which I’ll call “AzureBusInitializer” to set up my instance to MassTransit and get it configured. So, add another class library to the MtPubSubAzureExample solution and name it “Configuration”. Before creating our class, it’s time to head to NuGet and pull in MassTransit. 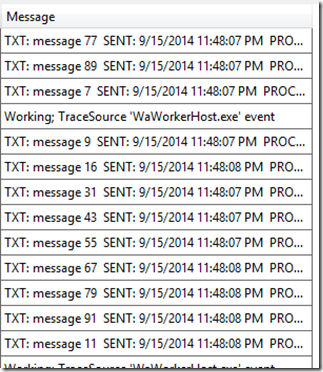 The quickest way to get everything you need is to find the MassTransit.AzureServiceBus package and install that. Doing so will install all of MassTransit and its dependencies. We’re creating a static method called “CreateBus,” which both our publisher and subscriber can use to set up an instance of a bus, using the Log4NetLogger, and connecting to our Azure Service Bus namespace. Because there may be additional custom setup that the publisher or subscriber may want to do, we allow passing in a lambda expression to perform the additional setup. We’ll make the publisher a very simple console application that just prompts the user for a number of messages they’d like to publish and then publish that many SomethingHappened messages. Add a new Console Application project called “TestPublisher” to the solution and add a new class called “SomethingHappenedMessage.” This will be our concrete implementation of the SomethingHappened interface. You’ll need to add a project reference to the Contracts (and add one to Configuration too, while you’re at it). Now, in the Main method of the Program.cs file in your Console Application, you can put in the code to set up the bus, prompt the user for the number of messages they want to publish, and publish that many messages onto the bus. Real quick first, however, add a NuGet reference to the MassTransit package. Now right-click on the MtPubSubAzureExample solution in the solution explorer and choose “Set Startup Projects….” From here, choose the Multiple startup projects option and set the Action for both TestPublisher and TestSubscriber to Start. Now when you run your solution, both the publisher and subscriber will run. Again, be sure to update the app.config for TestSubscriber to include your Azure key and namespace like you did for TestPublisher. Publish some messages from the publisher window. You should see them show up immediately in the subscriber window! What’s Going on in Azure Service Bus? So, by creating a subscription from our TestSubscriber, MassTransit automatically set up a topic subscription for us! Notice the timestamp from the message versus the timestamp of when the subscriber actually published the message. In this case, there was a 7-minute lag (the 7 minutes we were poking around in Azure before starting up the subscriber again). Now that we have a simple publish/subscribe example working, let’s have our subscriber actually run in the cloud. There’s a number of ways we could do this, but probably the most “cloudy” way to do it would be to create an Azure Cloud Service. These are extremely easy to create in Visual Studio 2013 (assuming you’ve installed the Azure SDK as instructed at the beginning of this post). 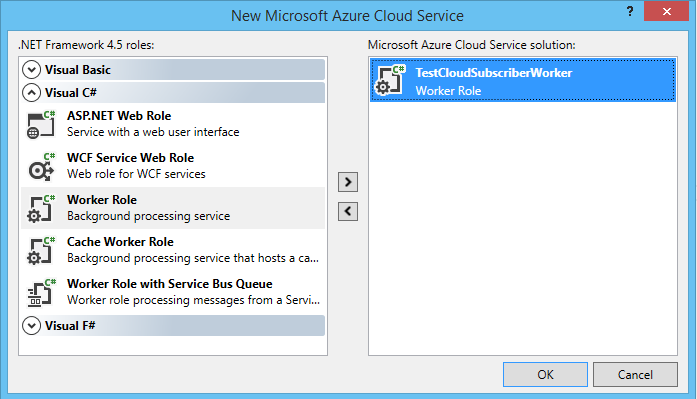 This will add the TestCloudSubscriber and TestCloudSubscriberWorker projects and drop you into the WorkerRole.cs file in TestCloudSubscriberWorker. As always, be sure to update the app.config for TestCloudSubscriberWorker to include your Azure key and namespace. Add a project reference to the Configuration and Contracts projects and add the MassTransit NuGet package to the new worker project. As you can see, our first instance of our service is running. Back in Visual Studio, you can right-click on the TestPublisher project and set it as the sole startup project. Run it and publish a few messages to the bus. Our cloud service should process the messages, but how can we be sure? 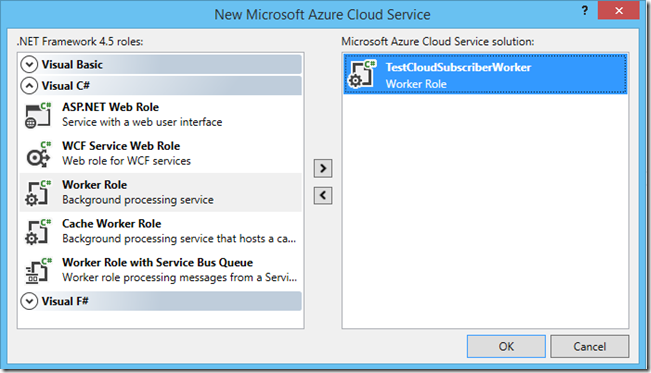 The quick and dirty way is to check the Queue Length of the mtpubsubazureexample_testcloudsubscriber queue. As long as this is a decreasing number (or a zero), then our cloud service is processing the messages. If you want more than that and would like to actually see the trace messages we are writing out from our cloud service, read on. Expand the “Roles” folder under the TestCloudSubscriber project in Visual Studio. 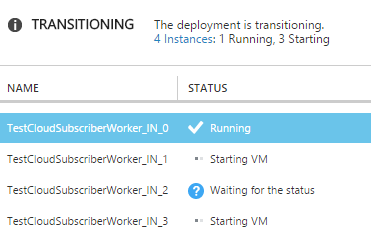 Right-click on the TestCloudSubscriberWorker role and select “Properties.” On the Configuration tab, find the Diagnostics section and change “Errors only” to “All information.” After doing so, re-publish your service to Azure and wait for it to restart. You probably don’t want to run your service with the “All information” option set all the time, but we do get a warm fuzzy feeling knowing everything is being processed the way we expect! Finally, set “Target per Machine” to how many messages you want a single instance to be able to handle at any given time. For example, if you have a single instance running, and the number of messages in the queue exceeds this number, then Azure will spin up another instance based on the above rules. Thanks Azure! In order to test this out, I actually stopped the cloud service so it wasn’t processing messages and then published 400,000 messages. I restarted the cloud service and it ran with one instance for a while, but pretty soon, it started launching new instances, based on my configuration (which I had dialed back pretty far to make sure the scaling would get triggered). 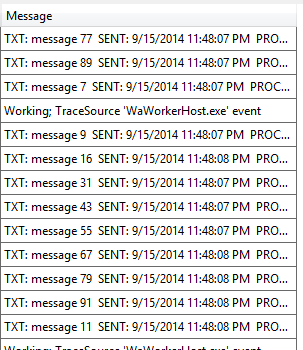 It worked great, and that backlog of messages was worked down to zero in no time. 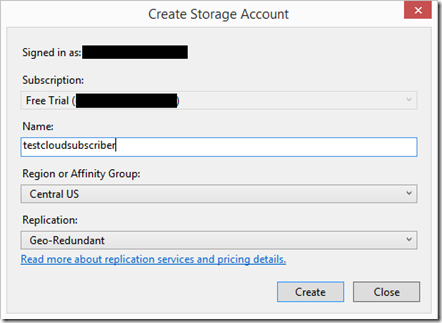 Hopefully, this post was helpful in getting you off the ground with MassTransit and Azure. Most of the topics dealt with in my previous articles dealing with MassTransit and RabbitMQ can also be applied to running MassTransit in Azure and with Azure Service Bus (with the exception of RabbitMQ specific topics). I hope to see you back here soon and, as always, please let me know if you have any questions or suggestions for future topics! Awesome post David. Thanks for showing us the “cloudy” way! I’ve left unchanged and it works. What is the owner and what looks like a shared key? Is that yours, what do I set that too? Good catch! It’s actually completely unnecessary (which is why it still works for you). It was leftover from my experimenting. I’ve pulled it out and everything still works. Brilliant, that explains my confusion! Thanks for the lightning fast reply. I’m glad you built this example – have you tried with the local version of Microsoft’s Service Bus (the extraordinarily-named Windows Server Service Bus!) to see if this works the same? To the best of my knowledge, the Azure Service Bus transport for MassTransit does has not been successfully tested to work with Service Bus for Windows Server. I believe it would be a simple matter for a developer to modify the transport code to make it work, but to date, this work has not yet been done. 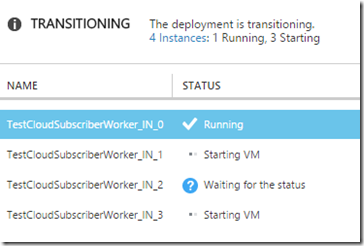 Great post, really helped me out in setting up my own MT/w Azure SB application. One thought though – I tried to lock things down a little – it feels wrong to be using such a root level SAS key, but things wouldn’t work at this point. Any suggestions/best practices for when running in production? Presumably “Manage” permissions are mandatory the first time this is run, in order for the topic, subscription and new queue to be created? Can permissions be changed to using Listen and Send afterward? I tried but had no success. I am trying to figure out a way to use MassTransit v3 with Azure service bus and just could not find a way to get it to work. I read online in several articles that it is possible. I saw you have an article on using RabbitMQ with Masstransit v3. If you have code sample for Masstransitv3 with Azure, can you please share a link to it. It will be of great help.